There are some terrible movies that have a special place in my heart because they took me by surprise with their superb endings. After doing my list of five good movies with bad endings, I figure it’s poetic to go ahead and serve up five bad movies with great endings. Let’s get started! I like Airplane! But I’ve never really liked its ending. As soon as the reporters knock over the phone stand, the movie is pretty much over to me. Seeing Robert Stack talking to no one while people stumble out of the plane isn’t particularly funny. Nor is the insane moment when Otto appears and manages to take off without the benefit of wheels. Airplane II: The Sequel, for all its faults, manages to have a much better ending. 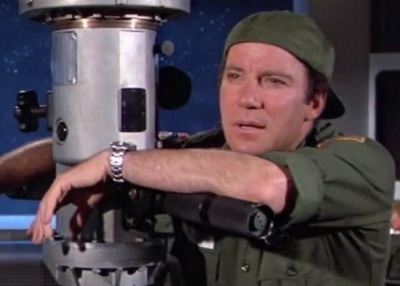 Ted Striker saves the day and William Shatner does exactly what Stack did in the first one. But this time his voiceover perfectly complements the montage of Ted and Elaine getting married, and it’s not just a random string of words. Well played, Airplane II. It failed to improve on just about every other recycled joke from the first film, but it definitely nailed the ending. This is for all you Mystery Science Theater 3000 fans out there. The Creeping Terror is a bizarre little film that is almost completely devoid of spoken dialogue. Most of it is narrated, which makes it feel like more of a slideshow than an actual film. Basically, a goofy-looking alien lands on Earth and proceeds to wander around eating one victim after another. Nothing can sate its appetite until the army finally learns its one weakness: Renee… oops, I mean grenades. Oh, and cars hitting it are effective, too. Despite the mind-numbing silliness of everything that happens in this movie, it actually has a really clever twist at the end. The alien was actually a probe sent by an alien race interested in studying humans and discovering if we pose any threat to them. By eating people, the probe was able to analyze our physiology and then transmit what it learned to the aliens. What could their purpose be? To conquer and enslave humanity? We’ll never know. But the fact that a movie this bad actually makes you think in the end makes it a much better film than the usual sort of schlock MST3K usually took on week after week. I actually have something good to say about RoboCop 2. Shocking, I know. I have to admit, the final fight between RoboCop and RoboCain is awesome. It is at least as good as the one between RoboCop and ED-209 in the first film. But this time, RoboCop can’t escape by simply walking down a staircase. He tries hiding in an elevator shaft, dropping RoboCain from a skyscraper, and blowing him up, but nothing seems to work. It’s a delight to watch RoboCop solve the problem by trial and error until he finally comes up with the (admittedly gruesome) final solution. And even the last line and the image of RoboCop fixing himself up are a fitting end to this flawed film. If the rest of the movie had used all of its potential the way this epic sequence did, it could have led to an amazing franchise. 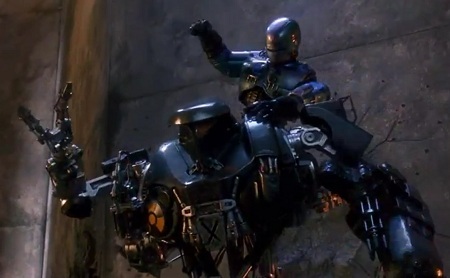 Let’s hope the RoboCop reboot manages to salvage some of the greatness of the past. I don’t know why people rail on this movie so much. It’s not that bad. This is one of the most enjoyable “bad” movies I’ve ever seen, thanks to Alec Baldwin’s conflicted hero, a seemingly unbeatable villain, and an absolutely insane performance from the always-dependable Tim Curry. But the best thing about this film is its ending. The villain is a descendant of Genghis Khan, and he is bent on taking over the world to fulfill his ancestor’s ambition. To accomplish this goal, he has become the most powerful telepath in the world, even stronger than the Shadow himself. The trouble with this villain is that even if he was locked up, he could just convince the guards to let him go in seconds. So this movie comes up with a brilliant solution to that problem. The Shadow launches a piece of glass into Khan’s frontal lobe. When Khan wakes up, he tries to use his telepathic abilities on a nearby doctor, but he discovers he had a portion of his brain removed to save his life… and eliminate his special abilities. So now all he can do is scream at the top of his lungs that he is the last descendant of Genghis Khan while other mental asylum inmates make wild assertions about being Babe Ruth and other famous figures. Now that’s a fitting comeuppance for this villain. This is such an unnecessary sequel. Terminator 2: Judgment Day logically followed the first film and provided a satisfying conclusion to the series. This movie just repeats T2 with a much less threatening villain and a lot of self-parody. It was a bad idea. But I will give it credit for doing one thing right. While the first two films ended on ambiguously positive notes, this one ends with a real downer. After spending the last third of the film trying to reach an underground bunker to stop SkyNet from launching its nuclear attack on the human race, John Connor and his girlfriend discover that it’s just an abandoned bomb shelter from the 1960s. There’s no way to warn anyone of the impending attack or stop the missiles from being launched. All they can do is watch in horror as the inevitable occurs. Not too many action movies are willing to do something this bold. Too bad the rest of the movie was so uninspired. Even the worst films can have something interesting to offer. Sometimes we have to look really hard to find any good in them, and sometimes those moments stick out even more because of all the dreck that surrounds them. Whatever the case, the films I listed above leave a great impression in the end, though you have to slog through a lot of badness to get to them. Can you think of any other bad films that end in spectacular ways? I’d love to hear about them. This entry was posted in Random Stuff and tagged airplane, bad movies, comedy, mst3k, robocop, sequels, terminator, william shatner. Bookmark the permalink. Great article Rob. I had forgotten about the ending to the shadow and had instead remembered only that it was a pretty silly movie that hasn’t aged well. Also, I have seen the last 30 minutes of T3 maybe 2 or 3 times but never anything earlier than that. You’re definitely not missing out on anything worthwhile in T3. You’re lucky to have skipped over all that and gotten right to the good parts, or as close as they come to good in that movie. 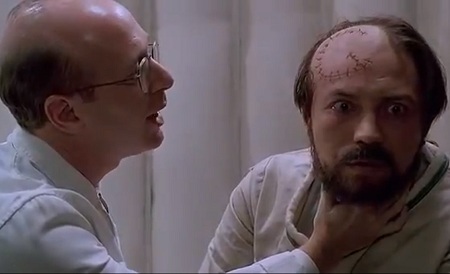 I actually really enjoy Robocop 2, hahaha. I’ts disgraceful schlock when compared to Verhoeven’s first robo film, but I can always sit down and enjoy me some Robocop 2. Just on a different level than many other movies. Nice List! I’ll agree with you about Terminator 3, simply because it kept up the theme of fate/destiny. For the rest, I have to give an unenthusiastic “mew” to. But I appreciate the enthusiasm with which your write. Keep it up. I’d like to nominate Pompeii. Weak psycho-thrilled. Crappy special effects. And apparently a sappy hokey happy ending, until …..
Trust me, the last five minutes ALMOST make the 2 hours of your life you wasted worth it. Wow. I’m intrigued. I’ll definitely have to check it out because I’m a sucker for bad movies and this one sounds like it comes with a special treat. Thanks for the suggestion.